This post contains some affiliate links for your convenience. Clicking these links will help support this blog so I can keep creating things to share with you, but you will never pay more by using an affiliate link. Click here to read my full disclosure policy. 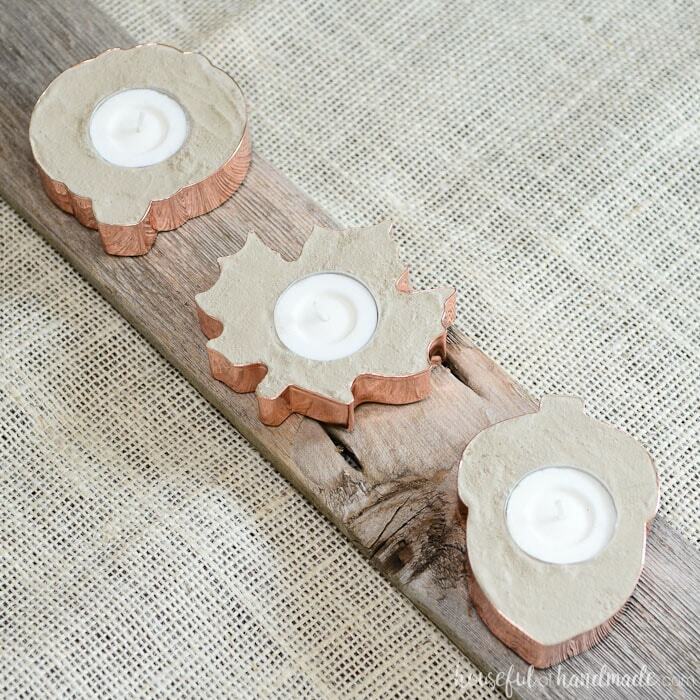 You can use regular concrete for these candle holders, but I like that the Maker’s Mix is lightweight and super easy to use for this small project. 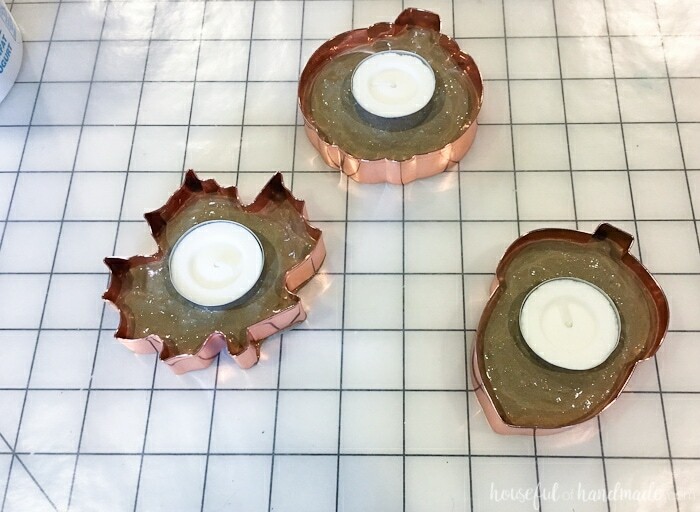 You want to use the tea lights that come in their own metal cup. That way when you have burned down once candle, you can remove the old candle and insert a new one. 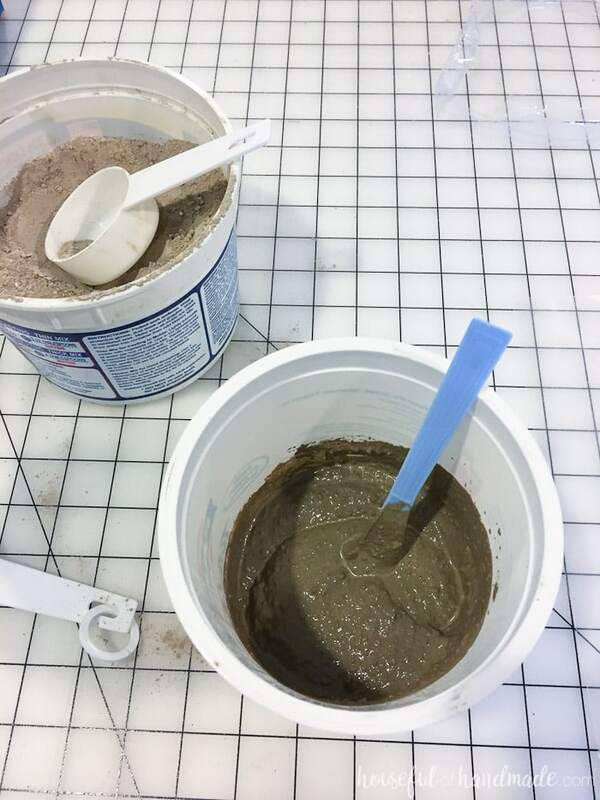 Mix together the concrete so it is the consistency of natural peanut butter (slightly runny, but can be scooped out). I mixed mine by adding the water first (4 Tbsp) then putting the Maker’s Mix on top of that 1/4 cup at a time (used about 1 1/4 cups total). Stir well so there are no lumps. 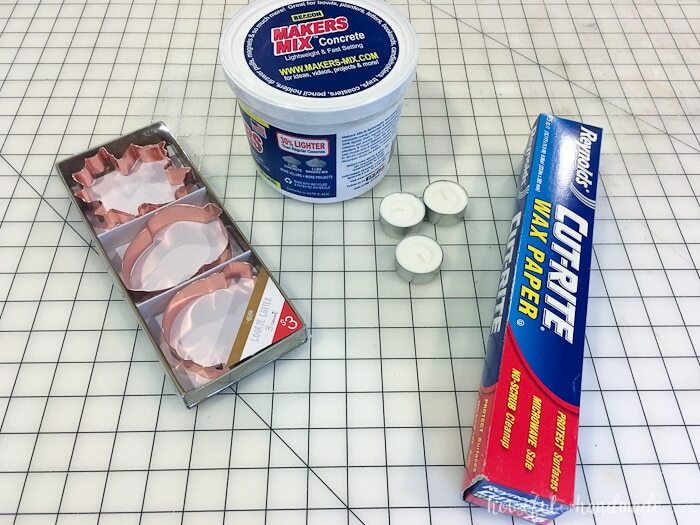 Place a piece of wax paper large enough to hold all your copper cookie cutters on the table. Fill the cookie cutters about 1/2 way up with the mixed concrete. 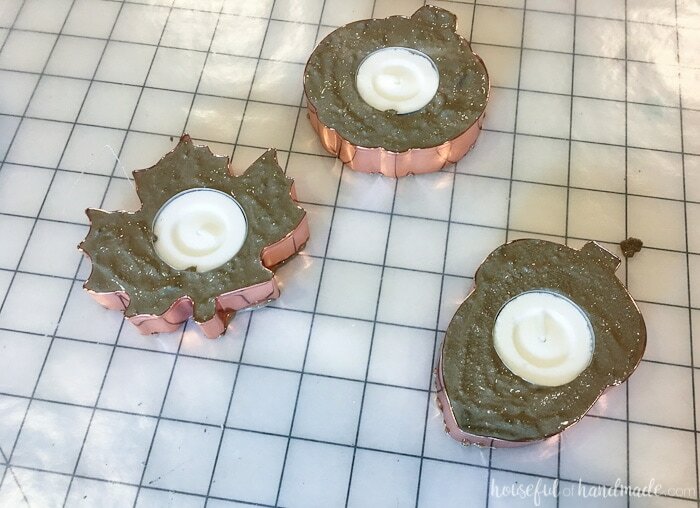 Place a tea light, with it’s metal cup, inside the center of each cookie cutter. Press it into the cement so the top of the tea light is flush with the top of the cookie cutter. 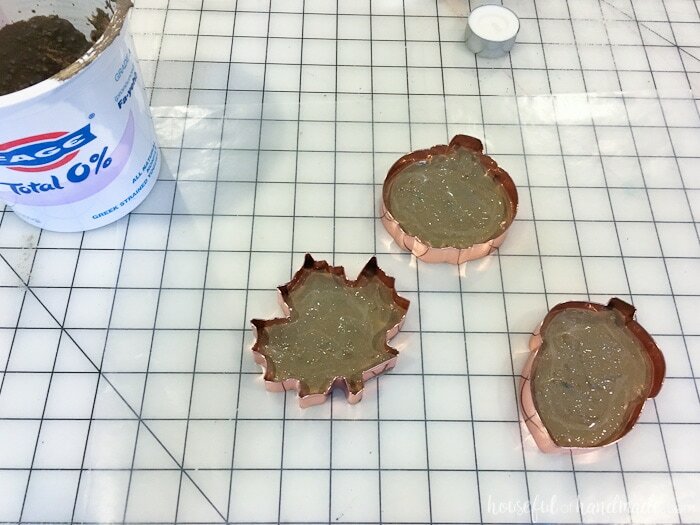 Fill up the rest of the cookie cutters with the mixed concrete. I found it was easiest to scoop it into the cookie cutter around the tea light with a plastic knife. Then used the knife to smooth the surface. Let the concrete dry. Luckily the Maker’s Mix is a fast drying concrete because I am not very patient. 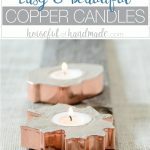 After about 10 minutes I was able to pick up the copper candle holders and knock off any concrete that had leaked out the bottom. 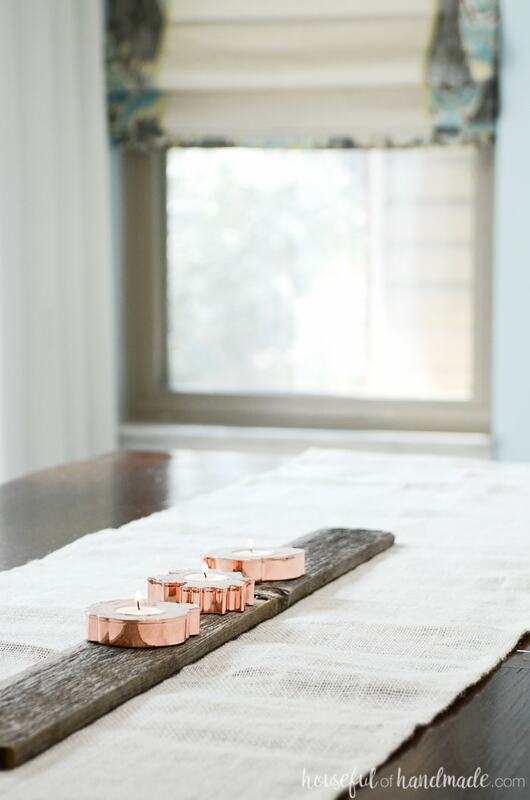 After they were completely dry, I added the copper candle holders to my fall tablescape and they were perfect. A little bit of sparkle was exactly what I needed. Simple and clever! Love it! Please can you tell me , where does one find Maker’s Mix ? You can find it on Amazon or in a craft store. 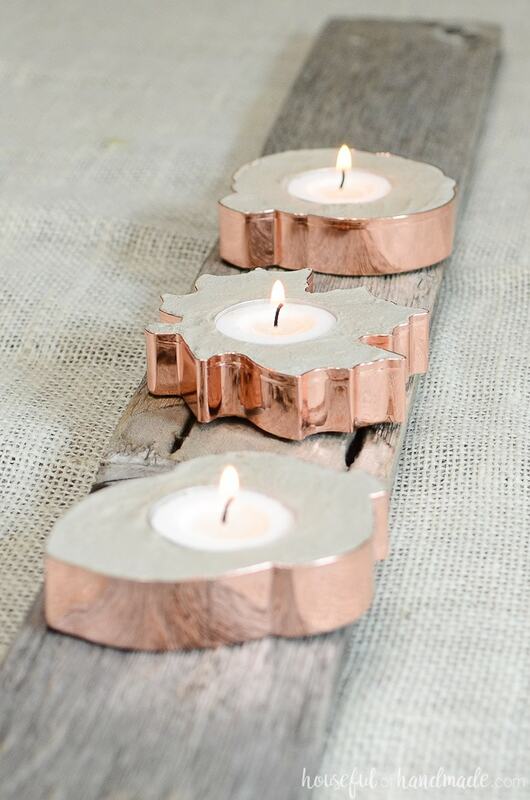 The tea lights in the copper cutters, beautiful, even I might be able to try this idea. Loved it, thanks for sharing!! You should definitely try it Linda! Its so easy and they are absolutely beautiful.